Construction is underway on the Willow Square Continuing Care Centre, a much-needed facility for Fort McMurray and area residents. 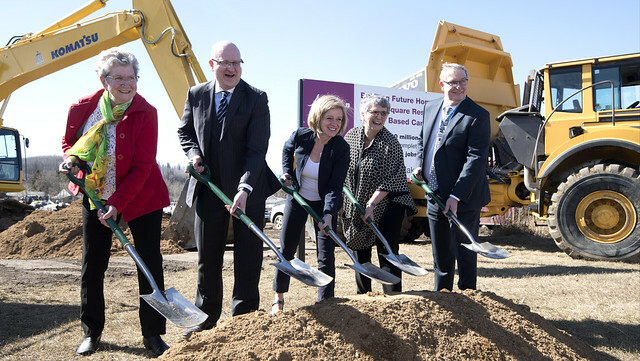 L-R: Myrtle Dussault, Mayor Don Scott, Premier Notley, Joan Furber and Murray Crawford break ground on the Willow Square Continuing Care Centre. The project, which is on schedule and broke ground today, will create 108 spaces with room to expand as the community grows. Expected to open in the spring of 2020, the new facility will offer various levels of supportive living, long-term care and palliative care. The $110-million centre is being designed and built by Pomerleau Inc. and S2 Architecture. During construction, the project will support 240 jobs, with an additional 127 full-time positions for care and support staff to operate the facility. The facility design supports residents by creating a community that includes a café, library, chapel and auditorium. A series of pathways will also ensure barrier-free access to local transit and other amenities. Alberta Health Services will operate the new facility and deliver a number of programs and services including resident spaces, home care, support services and the Northern Lights Bridges program, which is a day respite care program for the elderly, disabled, or people with dementia or cognitive impairment. “We are pleased to be the design-builder for the long-awaited Willow Square Continuing Care Centre our largest building project in Alberta to date. Pomerleau is excited to bring our collaborative approach to the region and to be growing its national presence. Our company is dedicated to transforming our clients' visions into reality and becoming a trusted partner in the process."